Bayler's invitations are finally done! Guess how much they cost me? $1.00! I am so proud of myself! I created the airline ticket in photoshop. It wasn't as hard as I thought. I think I am finally getting the hang of it! 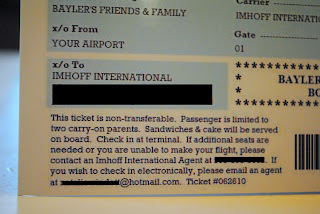 There is a new airline in town ... Imhoff International: Your Official Party Airline! I printed them all out at home using High Gloss Card stock. 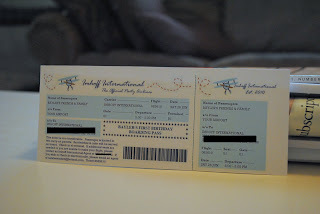 From there, I went to Kinko's and had them perforated. That is what cost me a dollar. After that was complete, I used their cutting table to complete the project. You can't tell in the pictures, but the tickets are perforated at the dotted line! With the party only a couple weeks away, I have been working away trying to tie up all the loose ends. I can't wait to show you what else I have been creating for the party! Yay for Bayler turning 1!! Have you ever been to the Runge Nature Center?